¡ Yo Fear-O Taco Bell ! I just had a filler enema! Well, Taco Bell wants you to know the truth. They are proud to announced that their “seasoned beef” product is a whopping 88% beef and only 12% other stuff. Forget about the daily grind, it’s time for an afternoon party! 88% is pretty damn good! Hot mess good. If only we could achieve that standard for everything in life. Taco Bell, deeply wounded by those nasty 35% allegations, wants to set the record straight. At least as straight as your small intestine. LOLZ! What a load of tripe! So they went and made a snazzy and informative website to straighten things out. It’s hip with a conversational tone and injected with at least 12% of snark. Is it just me or is eating at Taco Bell strangely similar to playing a game of Jeopardy? Ah, I get it. Irony. Well played. Okay, but I’ve heard you use Grade D meat. Is that why it’s so cheap? Although that’s funny, the answer is NO. In fact, there’s no such grade given by the USDA for beef. We use the same quality beef used in all ground beef (like you’d find in the grocery store) – only USDA-inspected, 100% premium real beef, period. We’re one of the largest beef buyers in the U.S. Every year, we buy about 300 million pounds of seasoned beef. Since we buy in bulk, we’re able to secure some of the best prices, which we pass along to you. But wait. What’s really being said here? Maybe we should go further than face value and try thinking critically. What can be learned from this text? Quality: A word with no legal meaning in the context of beef grading. USDA-inspected: “All meat transported and sold in interstate commerce must be federally inspected.” Source: USDA.gov. In other words, this phrase, although it sounds lofty, means absolutely nothing. It’s something that’s already true all of the time. Premium: “… as far as the food industry is concerned, is a completely unregulated word that companies are allowed to slap on anything, from an actual steak to membranes and gristle stapled together, yet the study proves we’re eager to pay 5 percent more for a piece of meat with that nebulous adjective attached to it, because we are, generally speaking, idiots.” Source: Cracked.com. Yep. Just like “Grade D” is not a USDA grade of beef, either is “Premium.” Taco Bell is trying to bamboozle you with this word. 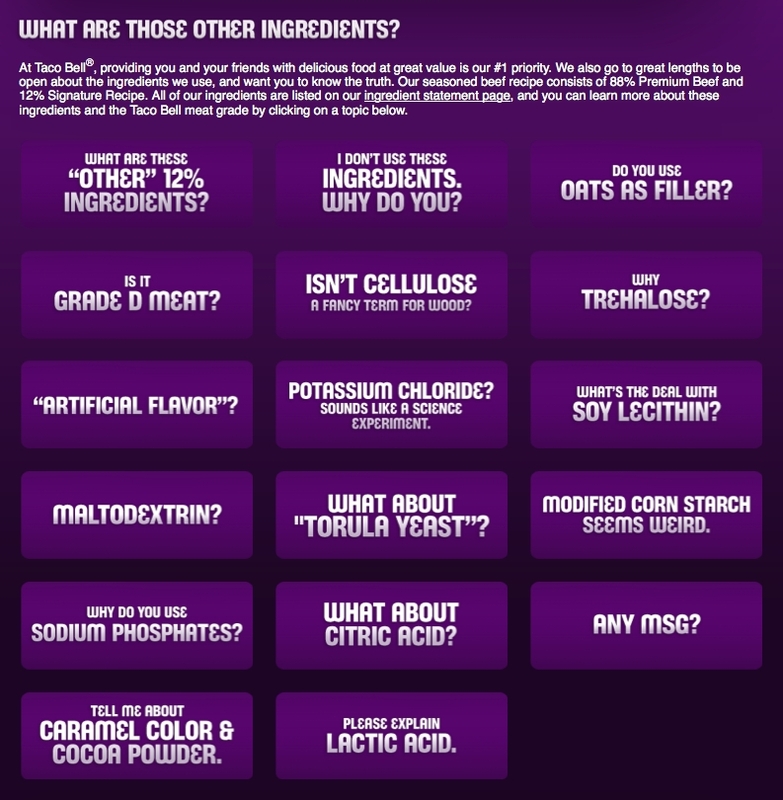 Am I to believe that Taco Bell built a fancy (other fake marketing word found on things like on your ketchup) website that doesn’t actually impart any meaningful information? Where’s the beef? It turns out the USDA does provide real grades of beef. Such as Prime, Choice and Select. Additionally, there is a dizzying array of additional categorization that can be legally enumerated to Nth degrees. A quality grade is a composite evaluation of factors that affect palatability of meat (tenderness, juiciness, and flavor). These factors include carcass maturity, firmness, texture, and color of lean, and the amount and distribution of marbling within the lean. Beef carcass quality grading is based on (1) degree of marbling and (2) degree of maturity. Interesting. It turns out that beef comes from something known as “beef carcass” (you didn’t hear that from me). Now that’s a term not heard all that often in fast food advertisements! It turns out that beef is graded on things like marbling, maturity, and skeletal ossification. I count no less than 16 different “USDA Quality Grades” ranging from Prime to Choice to Select to Standard to Commercial to, the fun one, Utility. Taco Bell chooses not to share the actual USDA Quality Grade on their informative website, opting instead to use meaningless marketing words meant to deceive and obfuscate their customers. Why? Why doesn’t Taco Bell reveal the real grade of their beef? That’s the heart of the matter. From this, I guess, we can infer how Taco Bell really feels about us: Slow-moving, dull-eyed, dim-witted and chewing our cuds. Ugh! I’d been eating clean(er, since it’s hard to verify anything food-related with 100% certainty) before my morning sickness set in, but ate whatever I could stomach for the next couple of months. Sadly, that was mostly Taco Bell. I ate it knowing it was in no way good for me, but still . . . the level to which they’ll go to obfuscate how terrible is their food product makes me glad I moved to somewhat less terrifying food for the second and third trimesters of my pregnancy. Yesterday was my first day back to pre-morning sickness eating, and already I feel the difference. I’m working now on finding recipes my son will enjoy, and inspired even more now than 10 minutes ago. What if there was truth in advertising? Yo Quiero Taco Bell – The minimum meat grade as required by law. Does that mean it’s bad to eat? Not necessarily, but it might not be what you want to eat. My general rule of thumb is that if the person who makes my food doesn’t want me to know what’s going on, then I probably don’t want to eat what they make. Well, even Grade D is passing. Or so I hear from my teenager. How did I “pass” up the opportunity to use the phrase “Taco Hell.” Dammit! Unless one is a termite ….! Oh my! When I was a grad student, we used to have our exams at night. Before each exam, I would go to Taco Bell and load up on cheap calories. That was 20+ years ago, and pretty sure that was the last time I ate there. You know I’m just using Taco Bell as an example, right? I think my theories hold true for any fast and/or processed food. I did some research. Information is hard to come by, but apparently there a type of beef known as “cutter” that comes from “utility” grade beef. Cutter is the leftover chunks from other cuts of beef. This is apparently the source of fast food seasoned beef for tacos and some ground beef sold in grocery stores. My understanding is that “utility” is the the lowest grade of beef that is rated for human consumption. Taco Bell takes this beef, portions 12% to other stuff in their “seasoned beef” product and proclaims it to be “premium,” a word that sounds remarkably similar and/or better than prime, choice and select.